This summer Todd and I enjoyed a roadtrip all the way to the Oregon coast. Tide Pools were high on my list, and I read that Cannon Beach was absolutely gorgeous, as well as a popular spot to see a large tidepool around the scenic Haystack Rock. When we arrived, we were treated to the prettiest little beach town, a long soft sand beach, blue coastal views and a truly wonderful tide pool experience. Here are a few photos of the Tidepools around Haystack Rock, Oregon and what we discovered within. Cannon Beach is a dream. It's expansive so even though there are a lot of visitors, there is still so much open beach it hardly seems crowded. You'll find tide pools near Haystack rock, which rises along the shoreline and is impossible to miss. Nearby a conservation officer provides tours of the pools during low tide, which starts around 3pm. Sections are roped off to protect access to climbing Haystack rock. The rock is a fragile nesting area for several bird species such as the Pelagic Cormorant and the Pigeon Guillemot. Other than this restriction, signs are posted to remind visitors to be gentle and careful where they walk as they navigate the pools. Here, Todd gently picks up a purple shore crab to show some nearby kids. He loves all the creatures I find creepy, and always tries to convince us how fascinating and miraculous they are. It's a Dad habit I find very adorable in him. Sometimes he has us convinced too. This little guy was pretty cute. 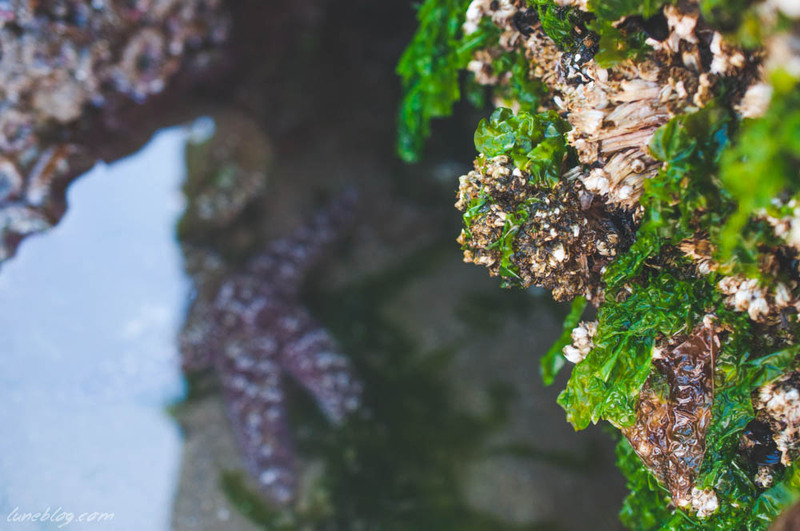 The tide pools are quite a sight, with rocks covered in California muscles and barnacles, limp sea lettuce and sponges. It's like walking into a giant aquarium. Truly amazing! The Giant Green Anemones above look quite unhappy, but when the tide rolls back in they will bloom and sway again. I wasn't able to find any that were covered with water at the time. The Aggregating Anemones and Ochre Sea Star below were basking in warm shallow pools and showed of their pretty colours. Look, but don't touch is the rule for these delicate creatures. Pictured above, a hermit crab (they move faster than you'd think), a western gull, and a horseshoe crab! 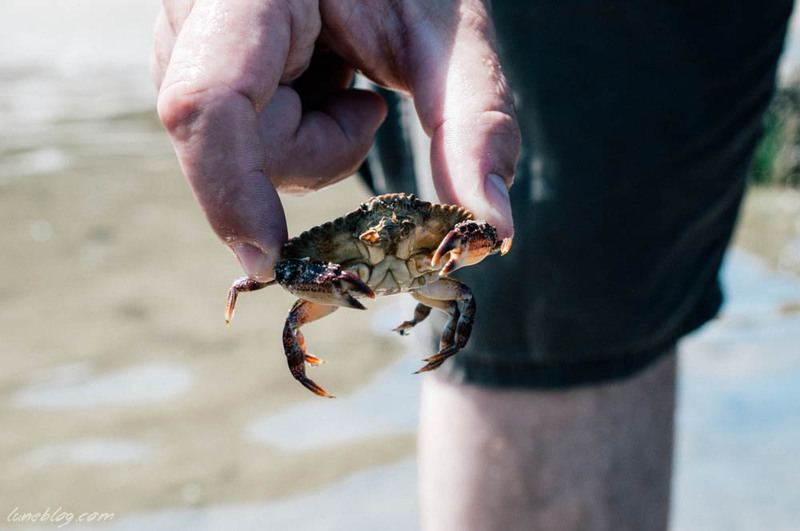 Sift a handful of wet sand and you'll discover these little Sand Crabs crawling in your palm. They have no claws, instead using their antennae to sieve the water for food. Again, we work as a team to get a closer look - because there is no way I'd touch one myself! There are many places to explore tidepools along the coast. 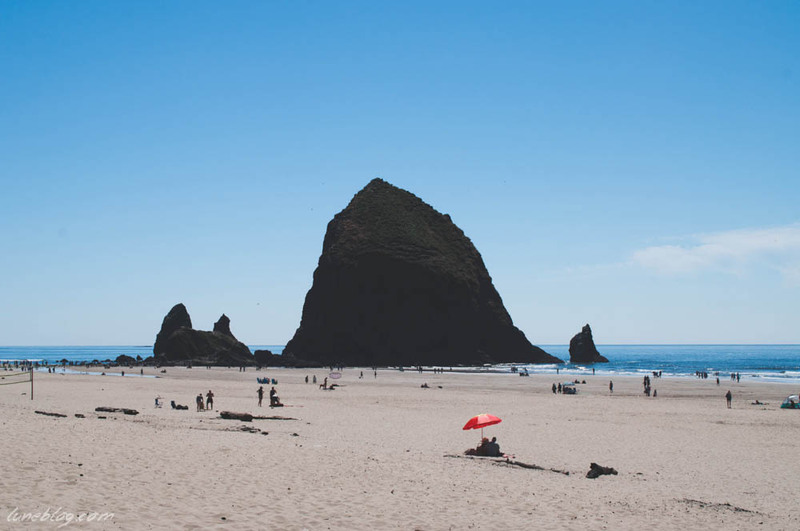 We have a few more wonderful creatures to show you from our time by the ocean, as well as a post dedicated to the lovely beach town of Cannon Beach. Stay tuned!